because of, the loveliest of things. the spirit of a just man, going home. Here are two markedly different Western Australian poets. Both pay attention to small facts of nature. Both treat poetry as a work of intimacy, not performance. In tone, both poets are closer to the voice of the diary than of the cafe or pub. Even when they deal, as they often do, with suburban domestic life, their poems mark out a place of inwardness. Yet their collections reflect and create different imaginative worlds. In particular, these two poets relate differently to time: Lansdown’s poems work to distil and preserve a single moment, whereas Gillam’s work to capture the moment-by-moment experience of time. Intriguingly, their writing habits reflect this difference. Lansdown works in a study, seated at a window, looking out. Gillam gets ideas for poems walking the back lanes around where he lives. This difference could be said to define the nature of each poet’s achievement. Lansdown engages consistently, though by no means exclusively, with the austere Japanese tradition. Almost all his collections include haiku or tanka sequences: short poems in syllabic verse that capture a single observation in exact and simple words. As one of Lansdown’s poems puts it, ‘Haiku are pebbles/ poets lob into the pond/ of our emotions’. Lansdown brings that understated discipline to his descriptions of the Australian landscape. The Australian painter Fred Williams once remarked thatAustralia’s landscape has no vanishing point. Working with haiku, Lansdown frees his poems from what you might call the argument of foreground and background. His are small-scale, exact observations. As a consequence, his haiku and short poems about birds and flowers achieve a sense of place remarkably free of the usual rhetoric of landscape. They are one of the best reasons to read this collection. Over nearly forty years, Lansdown has worked at this art of precision. Most of the poems collected here are new, but there are some from his award-winning 1993 collection, Between Glances, and some from his 2004 collection, Fontanelle. He started some of the poems newly published here more than a decade ago. Nonetheless, this selection has the coherence you might expect of a single collection. Together, these poems show how an aesthetic of exact detail and subtle craft has shaped his poetic idiom – has become the very language of his thought. Even many of the longer poems work with the kind of precision that haiku requires. Take ‘Fontanelle’, for instance – one of the standout poems in this collection. A poem of seven two-line stanzas, it maintains the lucidity and efficiency of haiku. It starts, ‘Strange, this seeing/ the heart in the head’. In this poem, the first line of each stanza has four syllables, the second, five: a heart-beat rhythm worked not by word-stress patterns, but by line lengths. But Lansdown is typically understated, and combines this clean use of language with a tone of unforced directness. is nestled. My sunpanels and pleasures. a lighthouse signal, far off. Naama Amram of Fremantle Press interviews Andrew Lansdown concerning his forthcoming collection, The Colour of Life, in the book Two Poets – June 2011. Naama Amram: Your collection in this book is called The Colour of Life. Can you tell us about the significance of this title? Andrew Lansdown: The title has, to my mind, two implications, or applications. Generally, the colour of life is the range of moods and emotions arising from the range of situations and perceptions depicted in the poems in my collection. Specifically, the colour of life is the sense of aloneness and longing that surprises us, ambushes us, repeatedly throughout life. It is a form of grief—grief felt, often, without evident cause. It is not a denial of the loveliness and happiness of life, but an underlying sense that something is missing and/or amiss. Well, so much for attempts at definitions! In the end, the colour of life can only be truly expressed in poetry or prayer. I have attempted to capture and convey it in poems such as ‘Happiness’, ‘Human’, ‘Me’ and ‘The Colour of Life’. Naama: You often work in the Japanese forms of haiku and tanka. Why? Andrew: I work in whatever poetic form will yield at the time of working. Often I do not know what form a poem will take when I begin writing it. The appropriate form becomes clear only as the poem progresses. As evidenced in The Colour of Life, I work in rhyming couplets (eg, ‘Prayer Against Pain’), rhyming quatrains (eg, ‘Train to Wyong’), free verse (eg, ‘The Nemesia’ and ‘Boat’), unique syllabic structures (eg, ‘Menace’, with 8 couplets of 6- and 10-syllable lines, or ‘End of Day’, with 10 tercets of 7-, 5- and 7-syllable lines), sestina (eg, ‘Sestina on a Journey’), choka (eg, ‘Renewal’), and villanelle (eg, ‘Prayer’). However, the forms most represented in The Colour of Life are haiku and tanka. I have found over the years—and increasingly in recent years—that haiku and tanka often suit my poetic purposes. I love the compactness and balance of both these traditional Japanese forms. And I love the discipline of writing in objective forms that compel and enable me to distil setting/subject/theme/mood in just 17 or 31 syllables. Naama: You have been publishing poetry for nearly four decades. What inspired you to write then? Has that changed, and if so, what inspires you today? Andrew: I was inspired to write at the age of sixteen when I heard a boy my own age read a poem he had written. I was astonished that someone like me could do such a thing and I desired to be able to do it, too. Also, at the time, I was listening to traditional and contemporary folk music by artists such as James Taylor, Donovan Leitch, Melanie Safka, Leonard Cohen, Bob Dylan and Steeleye Span. This type of music, of course, places great importance on the lyrics. I think this influenced me, too. What inspires me to write poetry today is the sheer love of poetry. I love reading it. I love writing it. I find it to be the perfect literary form for the expression of grief and joy and every emotion in between. Naama: What is your writing space like? And how would you describe your writing habits? Andrew: My writing habits are not as strict as I would like them to be. So many other things in life push in and push poetry out. I write mostly in my study, at my writing desk, in front of a large window that lets me see a birdbath, arrow bamboo, and an almond tree. Although I try to write every day, I do not always write poetry. Stories, novels and essays also have a claim on me. Naama: Poet and critic Lisa Gorton notes that both you and Kevin ‘treat poetry as a work of intimacy, not performance.’ In the process of writing this book, have you learned anything from Kevin’s work? Andrew: Kevin and I were not involved with each other when we wrote our poems and compiled our collections. It was, happily, Fremantle Press’s initiative to place our collections together under the Two Poets cover. I am very pleased to share a book with Kevin. As readers will discover, Kevin and I write very different sorts of poetry. Yet I think our collections compliment each other precisely because they are so different in style and sentiment. As for learning from Kevin: I cannot point to anything specific. However, I am convinced that reading good poetry contributes to one’s understanding of poetry, which in turn contributes to one’s ability to write it. On that score, I presume Kevin’s poetry has influence me in subtle, if indefinable, ways. I think Lisa Gorton is right to say that both Kevin and I ‘treat poetry as a work of intimacy, not performance.’ Implicit in her words are several truths about both of us as poets: we write with sincerity; we do not write to show off; and we write with craftsmanship and rigour. Naama: What is the greatest challenge that poetry presents to you, and how do you overcome it? Andrew: My greatest challenge in writing poetry is overcoming the feeling, as I face a blank page, and as I begin to toy with images and ideas, that I can’t possibly write another poem. At the start I feel I can’t do it; and at the end I feel I can’t do it again. I overcome this by persevering with the poem at hand—and by remembering that I have had these feelings many times before and many times before they have proven wrong. Naama: What writing projects are you currently working on? Andrew: I am working on another collection of poetry, provisionally titled Gestures of Love. It will consist of poems written solely in the traditional Japanese forms of choka, tank, haiku and gunsaku (haiku or tanka groupings). and on the Fremantle Press Facebook site here. Reading Book 2 in the Fremantle Poets Series had me wondering if I were a prospector coming upon not one but two gold nuggets of Australian contemporary poetry. With the younger of the two, Kevin Gillam, I felt I’d struck gold with his inimitable depiction of Australian suburban life, complete with characters, colours, smells and sounds-the background to the lives of most Australians. The sounds and other images have a richness and timbre only equalled on the national poetry scene by his co-author, Andrew Lansdown. We know the latter’s brilliance as a poet of family life and suburban bush creatures. This volume continually rewards with words of pure gold. 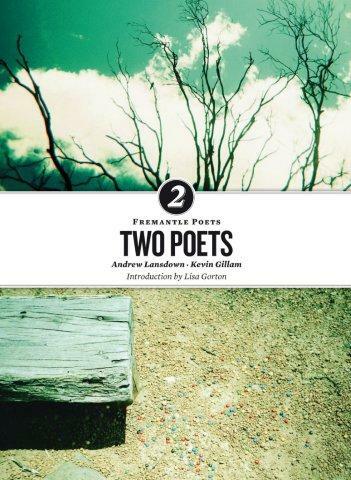 Gillam and Lansdown’s collections have been issued together in one book, the second volume in the Fremantle Poets series, Two Poets. Strange bedfellows? Lansdown, a Perth poet who has written 17 books of poetry and fiction, many for children, says he’s “not interested in writing things people can’t possibly understand and then pretend you’re being profound by doing that”. I love the first half of this book. Lansdown is an interesting poet. Totally unashamed of using the exclamation mark and it works for him mostly. His poems about childbirth and his growing child, and the relationship between this and mental health are sublime. Totally human, never gratuitous. The poem ‘Heat: After the third day of Desert Storm’ is stark perfection. The images are so vivid whilst using plain language. Possibly my only criticism is the overly-lamenting style of some pieces. It can be a little on the bush ballad side for me. The other half by Gillam fails to capture my interest. I could barely find anything to relate to and eventually put the put down permanently. I do recommend others giving it a go however – many of Gillam’s individual lines or verses are interesting – original ideas or takes on experience.